I saw a missile targeting an offender say "Thank you for your assistance, Galcop Viper". AFAIK the only OXZ that affects missile AI is my missile modification which is a simple hack of the standard AI with regard to ECM response. Sorry, of no help here but talking missiles? Standard missile: "Special Delivery for you!" Hardened missile: "Go on! ECM me! Drain those energy banks, I dare you!" It reminded me of a short story from Azimov, The Feeling Of Power. I suspect that this oddity may have the same cause: that missile may have had a pilot inside. Or perhaps Dark Star, where they're given AI to ensure they do the job properly. I've seen this sort of thing happen too. 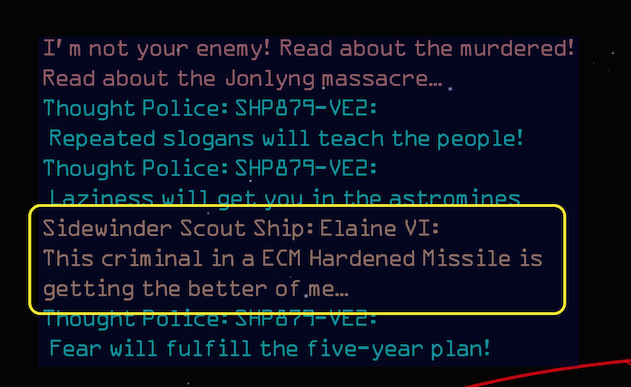 An entity is ending up with the wrong AI, or whatever code does the message sending isn't paying enough attention to AIs or ship types. We'd need one of the developers of the core game to say more, I think. The talking missile was probably piloted by a criminal. To be honest, this bug is sometimes so hilarious that I wouldn't mind if it were not fixed (for instance, by checking that the entity actually has a pilot, I've seen that property somewhere I think). For instance, I've see Vipers trying to reason with stellar serpents. I would say it's actually a cute bug. Is this reproducible in Strict Mode? Are we sure that it is a bug in core related to not checking for piloted entities rather than an OXP that (probably unwillingly) assigns pilots to missiles? Playing in strict mode isn't exactly appealing and I don't see talking missiles that often. Maybe a script could detect that them and dump enough info to give some clues on where they come from? Location: aboard the "Kiss of Time"